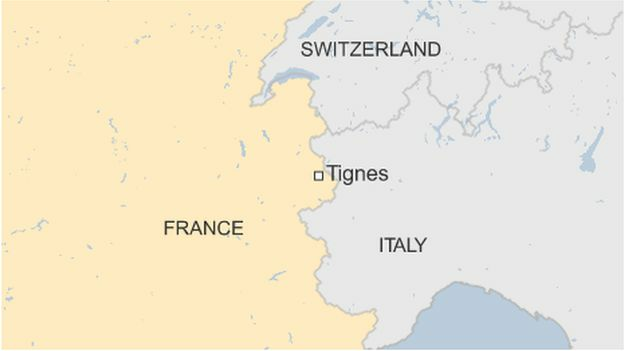 At least four people have died in an avalanche at a ski resort in Tignes in south-eastern France, rescuers say. A group of nine was buried after the avalanche swept through an off-piste area of the resort, and police say five people are still missing. The group was reportedly made up of eight skiers and a guide. The 400-metre (1,300ft) wide avalanche occurred at an altitude of 2,100 metres, and struck at a particularly busy time during half-term holidays. “Five people are still buried under a huge mass of snow,” said a rescue official from nearby Albertville. The avalanche appeared to have been set off by a group of skiers higher up, the ski station said in a statement. Rescue services deployed two helicopters as well as sniffer dogs to help search for the missing skiers. The incident is the worst in France since the beginning of this year’s ski season.